2015: The year that #squad died. Entry 6: This was the year that #squad died. Taylor Swift (second from right) and her #squad: Cara Delevingne, Selena Gomez, and Serayah McNeill in Los Angeles on Aug. 30, 2015. We spend a lot of Music Club gushing about the music we loved, but I’m also curious to hear about the music that disappointed us in 2015, or even better, songs that truly made our skin crawl. (Someone please say Charlie Puth and Meghan Trainor’s anti-aphrodisiac “Marvin Gaye.”) I say that because all this talk about crossovers, along with Carl’s mention of the disappointing Pitch Perfect 2, got me thinking about one of the songs that bothered me the most this year, actress-turned-pop-singer Hailee Steinfeld’s slinky self-esteem anthem “Love Myself.” I sort of feel bad picking on Hailee, because her heart’s in the right place—the song is, ostensibly, about the noble virtues of triumphing over a breakup and finding strength within. (It is also very obviously a song chock full of awkward masturbation puns, and Hailee’s demure assurance that “it’s open to interpretation,” made them even more awkward.) You can learn just as much about a given year in music from its successes as its failures, and for me, Steinfeld’s expensively blank face plant, the Haiz EP, was a fascinating encapsulation of pop music’s trends in 2015. Songs like “Love Myself” and “Hell Nos and Headphones” (an uninspired introvert anthem ripped very obviously from the playbook of newcomer Alessia Cara, who I’ll get to in a minute) demonstrate the complicated and kinda-depressing fact that self-acceptance, outsiderness, and yes, #feminism, were some of the year’s trendiest and easily sellable pop commodities. They also demonstrate the fact that if you know the right people (*cough* Taylor Swift *cough*), it is not that hard to launch an entire pop career out of nowhere and get a single to Top 40 radio. I think what bothers me so much about Hailee Steinfeld’s music is that it is an embodiment of one of 2015’s most pernicious trends. It is, heaven help us, #squad-pop. Alright, I’ve dropped the S-word; there’s no turning back now. I wish that Merriam-Webster also picked a word of the year to be banished from the language forever, because I do not think I am the only one who would have voted for squad. Now officially scrubbed of its hip-hop connotations, in 2015 “squad” came to be synonymous with Taylor Swift’s social circle of famous and conventionally gorgeous women, as well as a certain type of performative friendship and a watered-down strain of vague, fourth-wave feminism that seems to have something to do with … knowing a lot of models. If I sound mad, trust that I don’t hate it as much as Camille Paglia, who recently called Swift a “Nazi Barbie” in a truly inane and confusingly argued Hollywood Reporter essay. But for me, Taylor Swift’s 1989 Tour (which I caught on the July night that she brought out the U.S. Women’s Soccer Team and, inexplicably, Heidi Klum) was at once the year’s most fascinating and most frustrating display of female power. On the one hand, it’s great that the year’s most high-profile tour gave such a humungous platform to woman-on-woman friendship and female achievement. But on the other, as the clown-car of guest stars that Swift brought out in each city verged on the absurd (“please welcome to the stage … Julia Roberts and Joan Baez!”), it started to feel like Taylor Swift was not interested in a collective, collaborative vision of feminism so much as one that proved the dominance of her own brand. In music and in the American media writ large, 2015 was the year that feminism went from a defiant, niche political stance to an ideological product to be packaged, trademarked, SEO-tagged, clicked, and sold. Carl, I’m not quite sure we’ve yet seen the “backlash” to last year’s female-dominant year, but we’re perhaps seeing the moment right before it, when trendy but hollow expressions of “female empowerment” have become the status quo. In John Seabrook’s book The Song Machine, he talks about the former radio programmer Guy Zapoleon’s theory that pop musical trends move in three stages: “pure pop,” which gives way to “the doldrums,” which are then shaken up by “the extremes” of direct backlash. From “Love Myself” to Taylor Swift’s ridiculous, model-studded “Bad Blood” video, I’m afraid to say this year felt like the moment when pop-feminism started inching toward the doldrums. This is not to say that genuine expressions of female strength were absent from music this year—not at all. I just think they were lurking somewhere beneath the hashtags, in the songs that explored the messy complexities of women’s experiences more than empty, soulless sloganeering. I found this in Alessia Cara’s wonderful and terrifically self-possessed single “Here,” a soulful screed against sham friends that values the quality of companions over quantity. 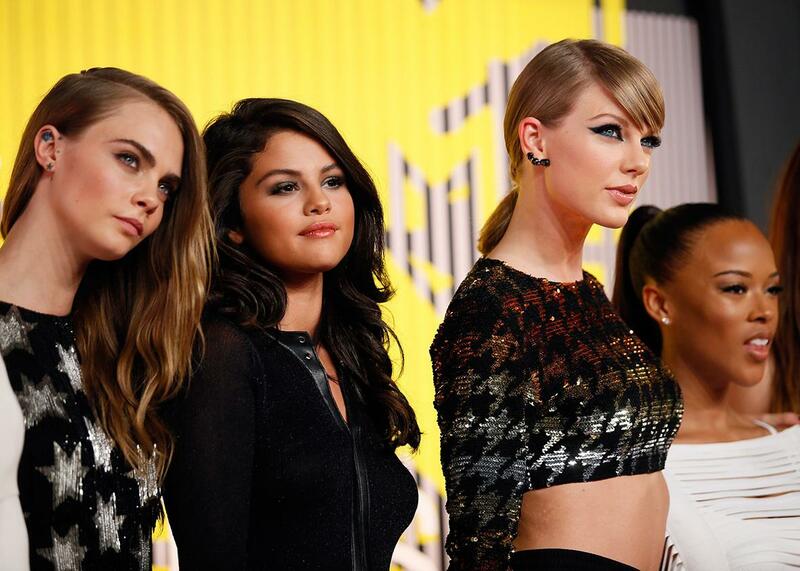 “But really I would rather be at home all by myself,” she sings, “Not in this room with people who don’t even care about my wellbeing.” It’s the anti-squad anthem, in a way (even if Cara did make an inevitable appearance on Taylor Swift’s stage). Norwegian experimentalist Jenny Hval dealt with this directly on her corrosive and brilliant Apocalypse, Girl, especially on a song in which she sings with an unconvinced sneer, “You say I’m free now, the battle is over/ And feminism’s over, and socialism’s over, yeah/ I can consume what I want now.” And back in the mainstream, one of my favorite pop albums this year was made by a woman who’s fine admitting she isn’t exactly tight with some of Taylor’s besties anymore, Demi Lovato, whose fiery Confident swung on a pendulum between candid moments of weakness and triumphant rebounds. Lovato is a fearless vocalist because she’s not afraid to let you hear her work—there’s a struggle in her voice that makes her songs so emotionally affecting. Sexual curiosity and body-positivity aren’t fads or trends in a song like the slick beach-jam “Cool for the Summer,” they’re convincingly felt states of mind. But Demi’s greatest moment in 2015 was her raw, respect-commanding rendition of the ballad “Stone Cold” on Saturday Night Live in October—probably my favorite televised musical performance of the year. Also, I’d be remiss if I didn’t mention Nicki Minaj and Beyoncé’s super-collabo “Feelin’ Myself,” (which technically came out on Minaj’s Pinkprint last year but was released as a single in 2015). It’s a female empowerment anthem with enough personality and precision to transcend the trope (and, unlike Hailee Steinfeld, it owns up to its masturbation jokes). Its glorious video was also a perfect counterpoint to Taylor Swift’s high-concept, star-studded “Bad Blood,” and as Minaj shared on her Instagram around Halloween, it all but invited its own DIY tributes. You don’t need explosions and action-blockbuster costumes to recreate “Feelin’ Myself,” just a kiddie pool and a couple of cheeseburgers.